1888 Rand McNally Map of Delaware, Maryland and Washington D.C. This is a fine example of Rand McNally and Company's 1888 map of Maryland and Delaware. It covers both states along with parts of adjacent states. Garret, the western part of Maryland, is detailed in an inset near the left margin. The map notes several towns, cities, rivers, railways and an assortment of additional topographical details throughout. This map is color coded according to counties with relief shown by hachure. 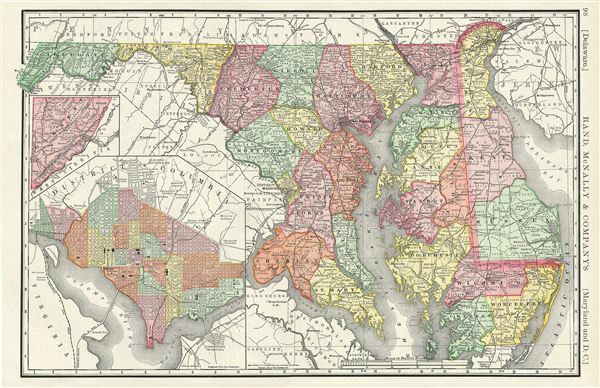 A large inset map of the District of Columbia is included in the lower left quadrant of the map. This highly detailed map reveals the city in considerable detail with color coding according to ward. Several important buildings and monuments including the Washington monument, the Capitol, the White House (not yet called the White House, but the President's House), City Hall, Navy Yard, and others are noted. The city's famous grid and ray structure appears according to Ellicott's updated version of L'Enfant's brilliant plan. Georgetown appears in the upper left corner with Georgetown College noted just outside the city border. This map was issued as plate no. 98 in the 1893 edition of Rand McNally and Company's Indexed Atlas of the World- possibly the finest atlas Rand McNally ever issued. Rumsey 2094.023 (1889 edition). Philips (atlases) 952.